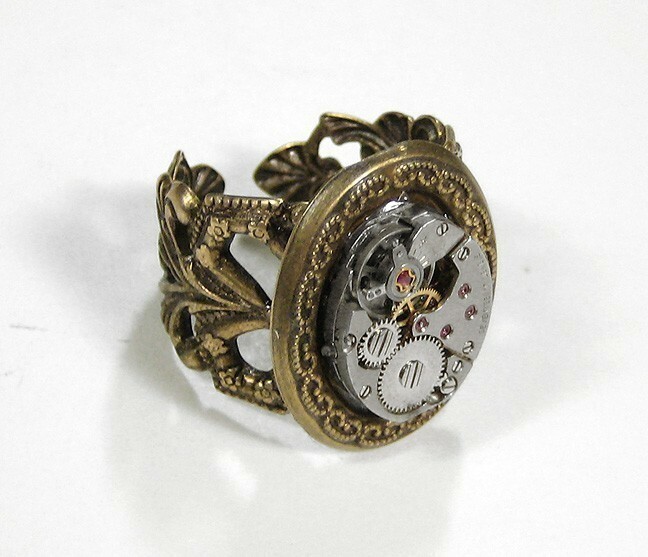 I randomly ran into this Etsy shop featuring steampunk jewelery pieces and thought I'd share. If you go ahead a bit and browse, you'll surely be amazed by the fabulousness. It blows my mind how much work it is put in creating these. I mean, days of work on tiny rings. I admire this. Maybe the amount of detailing going on can limit their wearability a bit. More than one at a time could be quite a challenge. Know what? I surely wouldn't mind. 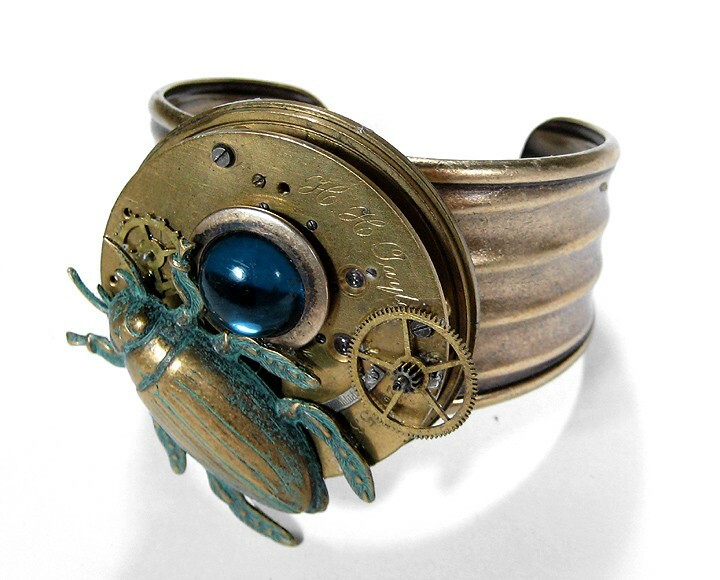 Luckily, I also found an interview with steampunk jeweler Ricky Wolbrom who onws the afore-mentioned Etsy shop. The rings, cufflinks and brooches she mades are combinations of silver filigree and vintage Swiss watch parts. You'll also see some rare goggles, impressive. Wow. Here's a part of the interview I liked best. Read the rest right here. Why do you think Steampunk is so popular? It’s kind of “fake nostalgia” for things that never were, right? Ricky Wolbrom: Steampunk is somewhat of a cross between Victorian and industrial, so both things existed at one point, though many elements found in Steampunk never existed simultaneously. It gets its popularity from a growing resistance to corporate modernization, the mass commercialization of virtually everything, coupled with the surge of nostalgia for all things vintage and antique. One of the most rewarding things about this type of jewelry is giving new life to broken and forgotten treasures. What many people cast off as junk and “old fashioned” is, to me, gorgeous and beautiful art. The care and quality that went into making the timepieces and vintage findings I use hardly exists today, and it’s wonderful to see these exquisite works of art showcased in a way that honors this craftsmanship. 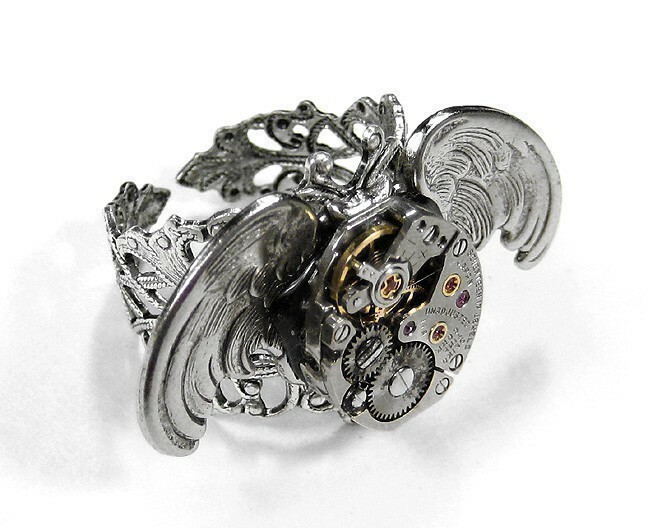 Anyone can see that these clockworks are as stunning as any other piece of jewelry.